Well, the phrase translates to nothing more than ‘The Adventurous Trio’, which wouldn’t have drawn too many readers in by itself, considering that, except for the truly gung-ho, outdoors types (a rapidly shrinking tribe), ‘adventure’, for most of us, has come down to events such as changing one’s own flat, hitching a ride to the nearest autorickshaw stand when one’s car or bike breaks down, trying street food in a new locality, drinking water straight from a municipal tap, or actually striking up a conversation with a stranger in a bus or train. 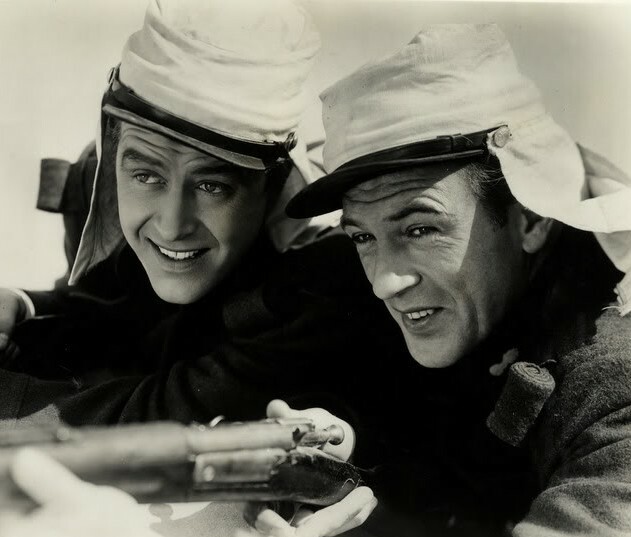 True adventure (the positive kind that leaves you with a sense of having proved yourself to yourself), however, now seems to be the preserve of the aforesaid ‘rapidly shrinking tribe’. The rest of us have excuses: no time, no money, no one to team up with…. . The honest truth, however, is: no idea, no energy, no inclination! We’ve got so caught up in (and used to) life that is, paradoxically, fast-paced yet pedestrian, that we don’t even realise that we (and only we) can brighten our own lives. We don’t have to live a life that’s filled with amazing adventure. Even if it’s just a little bit, modestly adventurous, once in each phase of our lives, it would help us build and sustain confidence in ourselves, and give us some sense of control over our own existence. 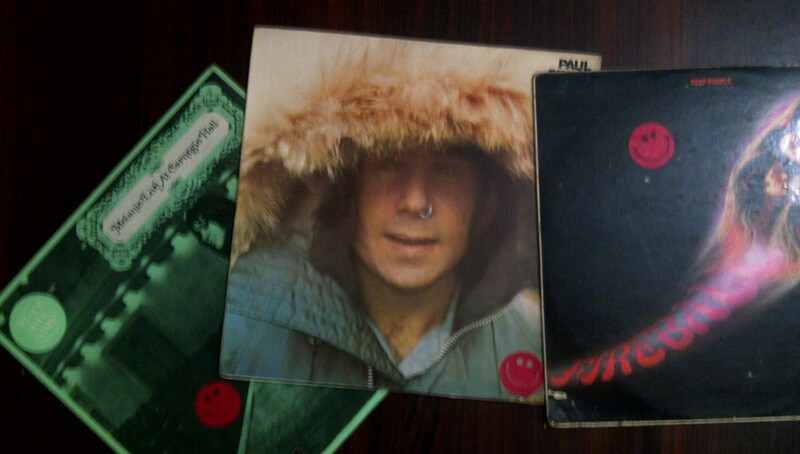 Here’s something that many of us grew up with, in the 50s and 60s – The Happy Wanderer. It’s a really old song. The original is a German song from the 1850s. The English version, first broadcast by BBC, appeared in the 1950s. However, it’s still as fresh as ever, and is the perfect song to get children interested in outdoor adventure. It was one that invariably came to mind when, as children, we were out hiking, or trekking, or even on school picnics. 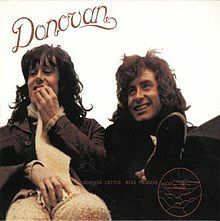 And here’s a song by Donovan, from his album ‘Open Road’. Though it’s called New Year’s Resovolution, it’s essence is a message that’s perennially relevant – Break Free! He sings – “..do what you’ve never done before…”. On the left: Uday Bajekal – alumnus of Rishi Valley School, Madanapalle; now senior finance wiz. In the centre: Roy Reddy – alumnus of Kendriya Vidyalaya, IIT, Madras; now senior JOAT(mon). 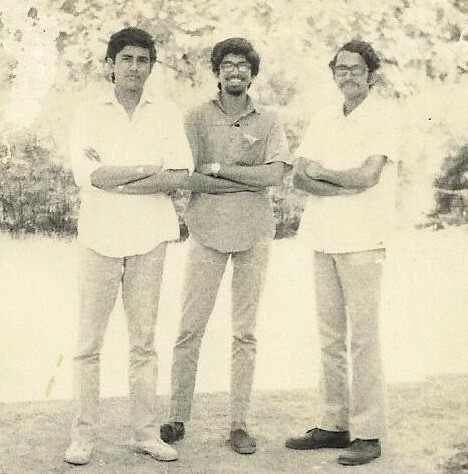 On the right: Madhukar Kamath – alumnus of Kendriya Vidyalaya, Tambaram, Madras; now senior ad-world honcho. The three of us were classmates as undergraduates, At the time of our adventure (December 1972) we were in the second year of B.A. (Economics) at Loyola College, Madras (now Chennai). While Madhukar and I were day-scholars at that time, Uday, whose parents were in Bangalore (now Bengaluru), was a resident of the college hostel. It wasn’t academic interest that we had in common – Uday was actually interested in Economics; Madhukar studied it because he was determined to use it to get ahead in life; I read it because I had to pass the exams! Non-academic interests were what we had in common, cycling being one of them. Uday and Madhukar had Hercules and Raleigh cycles, as I recall. In those days we considered those two brands to be as close to perfection as anything man-made could be. My cycle – the one you’ve met in an earlier post – was an Atlas, and it was well-known in college. It was a lady’s cycle that I had tried lending some masculinity to by stripping it down to its barest essentials, its only accessory being a grey canvas knapsack suspended from the handlebar! For those of you who’ve lived a cycle-deprived existence, let me assure you – it’s never too late to welcome one into your life. Life on a cycle can be (and always was) great fun! 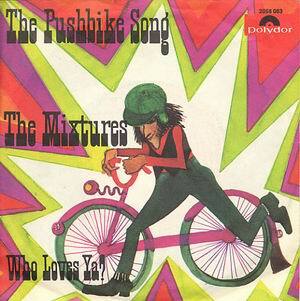 An Australian band called The Mixtures came up with ‘The Pushbike Song’ in 1970, and had a short black and white clip to promote it. (Such promotional clips, which we now call music videos, first appeared in the 1950s. Let it never be said that this blog is not educational!) Here they are – song and clip. The version that most of us heard over the radio, though, was a cover by a British band that called itself Mungo Jerry. You’ll find that version too, on Youtube, with some slapstick video to go with it. One evening, sometime during October or November ’72, the three of us were shooting the breeze in Uday’s room. In the course of conversation, Uday mentioned that he would be taking his cycle back to Bangalore, by train, when returning home for the December vacation. One thing led to another, and in the space of half an hour, we arrived at a plan – the three of us would ride to Bangalore, and, after a day or two there, Madhukar and I would ride back to Madras. When we told our parents, though, there was only one question – the same one in all three homes – “Must you?” It took a little convincing, but they did accept, soon enough, that we must. They had some worries – such as the possibilities of exhaustion and heat-stroke, and they gave us suggestions on how to deal with those. Amazingly (and this tells you something about their confidence in us and in the road-users of that era), the possibility of a mishap on the road was the least of their worries. The first matter, of course, was finance. We didn’t need much. Just for chow along the way, and for emergencies. We figured that about 50 rupees apiece would do (this was in 1972, remember). While my parents were quite willing to chip in, I decided (in the glorious idealism of youth) that I would earn the money. 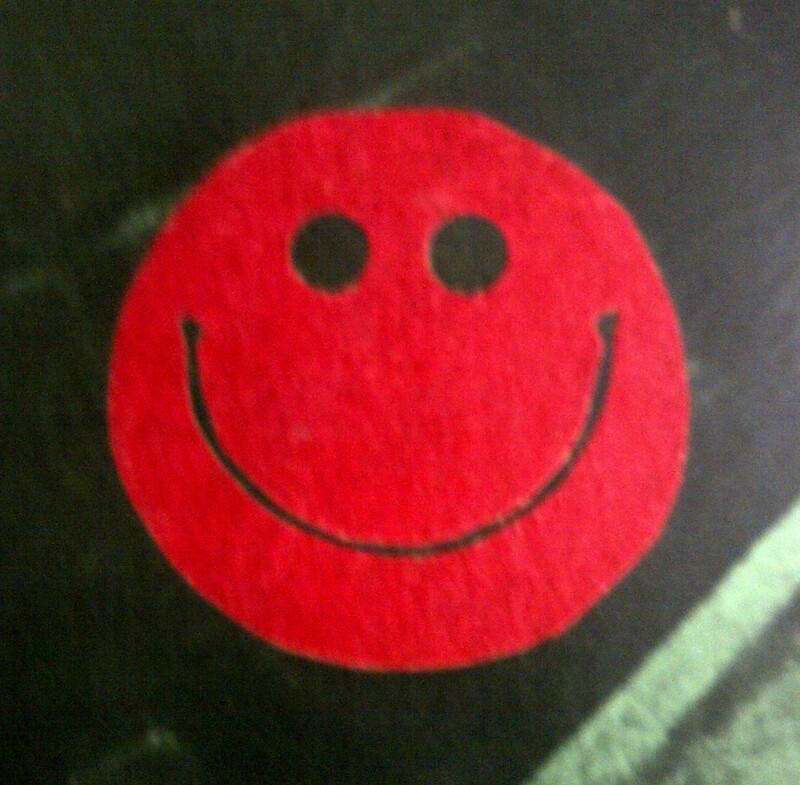 So, I set about making paper smileys (the smiley wasn’t an item of mass production in those years). Using coloured glazed paper, a cap from a Quink bottle, and a razor blade, I made 600 of them. I sold them at 10 for a rupee – to classmates and friends. There wasn’t much discussion over the choice between the two routes from Madras to Bangalore – via Chittoor and via Krishnagiri. We decided on the former since, of the two, it was the one with more tree cover along the highway. It would take us through Chittoor where we would be able to stop at my gran’s place for the night (for some TLC). And, it would take us through Uday’s territory, the Madanapalle hills (ghats, as we call them here), where the ups and downs would be fun (we thought). The plan was that we’d cover the distance (Madras – Ranipet – Chittoor – Palamaner – Mulbagal – Kolar – Hoskote – Bangalore, about 350 kilometres in all) in 2 days. Equipment wasn’t an issue, simply because we had no access to any fancy stuff in those days! Things like cycling helmets and knee-guards were considered necessary only for those in Olympic events and the Tour De France. We did, however, acting on the advice of my concerned sister (who was then pursuing her MD), buy ourselves athletic supporters (a.k.a. jockstraps). We used them too! Living proof of this is in the healthy kids the three of us have helped contribute to the world! All-white clothing was automatic. Activity shoes came in only one type in those days – white canvas shoes (a.k.a. PT shoes). Exercise clothing (shorts and T-shirts) was invariably white too. With the idea of adding a dash of colour, I offered to paint designs on the Ts. Uday and Madhukar were, understandably, sceptical of my skills with a brush, but, buoyed by the spirit of the occasion, gave me a T-shirt each. So, we ended up with white Ts with large orange doodles on the front and back. To protect our craniums from the sun, we got ourselves caps. The now ubiquitous baseball cap was then an imported rarity. 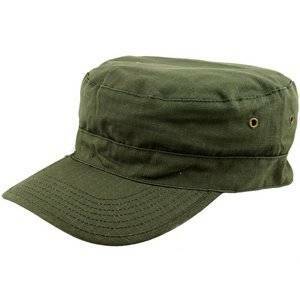 Ours were khaki field caps, purchased at Moore Market. Uday also had a large floppy hat of indeterminate origin. I stitched a hand towel to the rear edge of mine since our medical advisor (my sister the physician) had explained that it was important to also cover the back of the neck to guard against sunstroke. This earned a few laughs from friends, when I wore it. 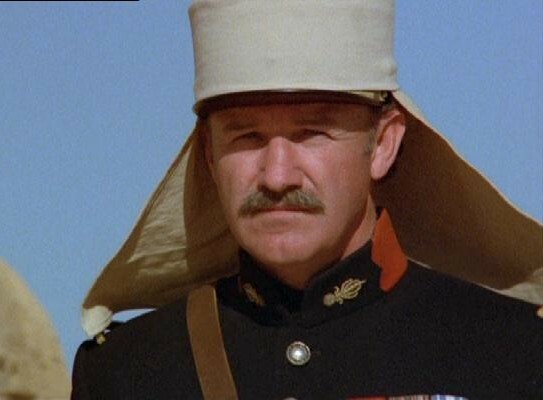 My self-assurance, however, came from the knowledge that I was keeping alive a time-honoured tradition that (going by that encyclopedia of all things military – Commando comics) began with French Legionnaires in the Arabian desert. Considering that cycles don’t break down (they go on for ever) our emergency kit consisted only of stuff to patch punctures, and Dettol and Band-Aid to patch ourselves. We also carried a strip of Anacin, and a small packet of table salt (as advised) to ingest in case conditions got very sweaty and the resultant loss of salts caused cramps. In the week preceding the trip, we ‘built stamina’. Each morning of that week, we met at Chetpet at 6, and cycled a couple of hours at a steady clip, covering 40 to 50 kilometers depending on the route we took. By the 5th day or so, we were doing the 50 with ease and were feeling absolutely invincible! We were packed and ready by the night before we started. Each of us had a little duffel bag tied onto the cycle carrier. Mine carried breakfast, sandwiches of 3 kinds, which my mother had prepared. Madhukar’s had lunch, which his mother had prepared – parathas and 2 mouth-watering Konkani ‘sabjis’. Uday’s had snacks – he’d bought biscuits, sliced cake, and savouries – for in-betweens. (All food was for the first day.) Each of us also had a plastic 5-litre ‘jerry can’ filled with water, tied to the cycle frame. I had my camera, an Agfa Click III, a simple ‘aim-and-shoot’ appliance that took 12 snaps to a roll of film. I didn’t pack it. Since I wanted to be able to take candid shots, I had it in a case that I could carry on my chest. I went to bed by 10, but I wasn’t sleepy at all, and I’m sure that’s true of Uday and Madhukar as well. I was just waiting to get to the rendezvous, Madhukar’s house at Kilpauk. But I must’ve fallen asleep very fast, and I must’ve slept very soundly, because the alarm seemed to go off almost immediately (at 4 am), and I was out of bed in a trice, raring to go! Some random thoughts about the context in which we received this song: Everyone looks back at the decade between the mid 60s and the mid 70s as the period when the world changed, a period of social and cultural revolution, especially for teenagers and young adults. ‘Born to be Wild’ turned out to be an anthem of sorts, for many of us, in our years through college – a song that we related to because we thought it captured the moods of both change and adventure. We pretentious youth liked to consider ourselves agents of change. Well, we were certainly part of that change – most of us were the paper boats swept forward by the waves that were generated by the few who (now that we look back, we realise) had the gumption (or foolhardiness) to actually stand up and rebel. This entry was tagged Agfa Click III, Bajekal, cycle trips, cyclists, Donovan, field caps, Foreign Legion, Happy Wanderer, M P Kamath, pushbike, smileys, Steppenwolf. Bookmark the permalink. ← What do you see (…with eyes wide shut)? Eagerly waiting for the next post……….soon! I see the 50s through your writings. Like every young lad I have had my share of adventures but not quite similar to what you have been sharing. Thanks for sharing things that are so simple but yet, Truly adventurous, Truly amazing.. Happy times captured in happy tone and spirit. SENIOR JOAT indeed. cycling, music, photography , art & craft ,reading , teaching and writing. waiting for the next post. the adventurous part!!! It’s so true that we ourselves can bring the desired change in our lives. Yet are always apprehensive about things that do not even matter. Waiting for some clarity & a tiny ounce of courage!! Someone a while back mentioned that the modern day cycles cost a tidy sum. I guess that equipments are the issue now…..the helmets, the shoes, the clothes, gloves, lights on the cycle etc. What’s lacking maybe is the spirit……who would imagine today that one can reach a distance of 350 kms unscathed. No mobiles just hopes!!! Way to go and waiting to read more.